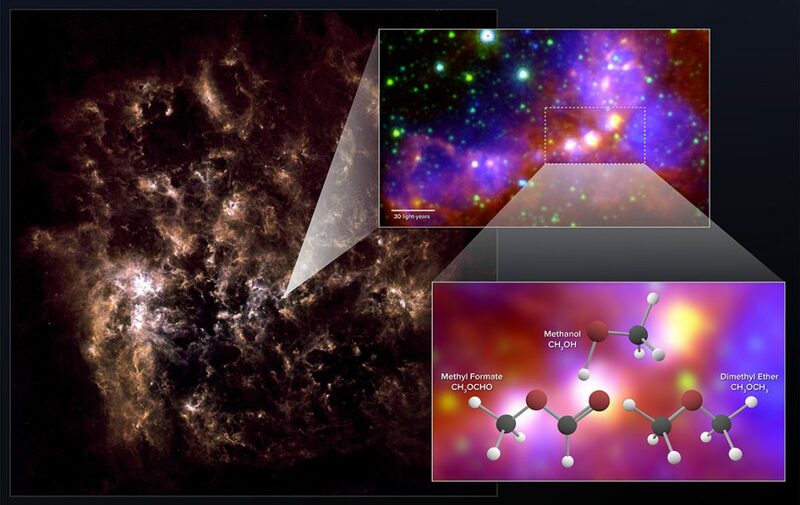 [img3="Astronomers using ALMA have uncovered chemical “fingerprints” of methanol, dimethyl ether, and methyl formate in the Large Magellanic Cloud. The nearby dwarf galaxy known as the Large Magellanic Cloud (LMC) is a chemically primitive place. Unlike the Milky Way, this semi-spiral collection of a few tens-of-billions of stars lacks our galaxy’s rich abundance of heavy elements, like carbon, oxygen, and nitrogen. With such a dearth of heavy elements, astronomers predict that the LMC should contain comparatively paltry amounts of complex carbon-based molecules. Previous observations of the LMC seem to support that view.